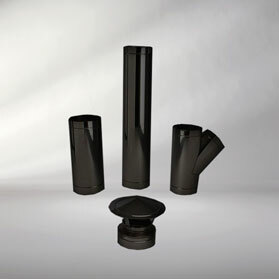 Powder Coated Matt Black HT-S.
Powder coated matt black HT-S twin wall class 1 flue. Midtherm HT-S is a Class 1 Twin Wall insulated flue system for medium/high temperature, gas, oil, solidfuel and multifuel applications. Powder coated Matt Black, in a full architectural polyester powder - TGIC with a 30% gloss level. Matt black HT-S is available in 125mm, 150mm, 175mm, 200mm, 250mm, 300mm and 350mm. HT-S has a 0.5mm 316L 2B grade stainless steel inner liner with a welded seam, 25% thicker than most other twin wall systems on the market, 0.5mm 304 BA grade stainless steel outer casing with a welded seam and 25mm high density mineral wool insulation. HT-S has a smooth, modern appearance, the external liner has a mechanically formed socket and spigot connection that ensures a consistent, easy, close fitting joint every time. The locking band has an over centre stainless steel clip that is easy to secure. This locking band is a channel type giving a smooth line to the system and improving aesthetic appearance of the flue. HT-S is designed for the domestic and commercial market serving gas, oil, solid and installations, peat, wood and other biomass. Midtherm HT-S has a high temperature or low temperature negative pressure designation depending upon the components used and the installation design making it a good all round product for multiple installation requirements.